Asthma can be a real problem during the cold weather. Inhaling cold air causes drying of the airway wall and more severe bronchospasm that moderate temperatures. Don’t think that coughing and shortness of breath is just cold air; it may be your asthma getting out of control. Learn how to cover your nose and mouth with a scarf or mask, even if you’re outside for a short period of time. And most of all, use your regular inhaler (controller) during the winter months if cold air or upper respiratory infections are triggers for your asthma. Another problem with the winter season is trying to figure out if I have a cold, flu, sinus, or allergy problems. Let me make this much easier for you. Most ragweed is done pollinating by the end of October, so without much pollen in the air, your sneezing and coughing is probably not due to allergy (no exposure). A cold usually lasts < 1 week and any congestion or runny nose that doesn’t resolve from one Saturday to the next is probably a sinus infection. Why does this matter? Sinus infections should be treated with the “all or nothing” approach as any infection left in the sinuses will only result in more infection. Catching the flu makes you feel terrible and you’re already coughing. What could be worse? Add a fever with muscle aches and your diagnosis is most likely some type of influenza. Good motivation to get your flu shot! Am I Allergic to the Cold? I’m glad you asked. Cold-induced hives stays hidden for most of the year and comes out with a vengeance during cold weather. Some instances can be life-threatening and this condition is nothing to take lightly. Cold-induced urticaria of course, responds best to a vacation at Key West, but if you don’t have the luxury or flexibility to do that, antihistamines are still the backbone of treatment. Be careful when shoveling snow as shortness of breath and chest tightness may be associated with hives and a cold-induced reaction. Although you must be careful with cold weather illness, you have to do something outside or you’ll get cabin fever. The link below is from AAAAI on how to control your asthma and still participate in winter activities. It’s a good read in front of the fireplace with a cup of hot chocolate. In the meantime, I’m heading for the slopes! Oral food challenges are the gold standard for diagnosing food allergies in children, but only a small fraction of kids in the United States are getting them. At the American College of Allergy, Asthma & Immunology 2011 Annual Scientific Meeting Dr. Gupta reported from her study that oral food challenge was done in just 15.6% of children that really needed the test. “Food allergy guidelines just came out in March of this year from the National Institutes of Health NIAID [National Institute of Allergy and Infectious Diseases] stating that oral food challenge is the proper test to diagnose food allergy, along with medical history and positive skin and blood testing,” Dr. Gupta said. In Dr Gupta’s study, only 47% had a skin test and 40% had a blood test for food allergy. “Overall, what this tells us is that food allergy is not being diagnosed optimally and oral food challenges are definitely not being done enough,” she said. What are your thoughts about food allergy? 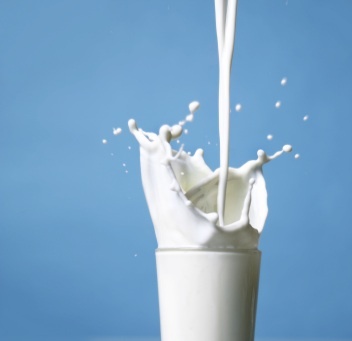 Have any readers experienced a “misdiagnosis” of food allergy? I’d love to hear from you! How many times have we heard patients say they are “allergic” to drugs like antihistamines and corticosteroids? Hypersenstivities to medications used to treat allergic diseases are fortunately uncommon. This is Dr. Stadtmauer’s experience with “allergy” to Benadryl….check the references below–it’s legit! “I have seen a couple of cases of drug exanthem from antihistamines but never immediate hypersensitivity…until now. I recently saw a young woman who has had recurrent urticaria/angioedema of immediate onset due to Benadryl. She had no associated symptoms. Scratch testing to Benadryl 5mg/ml was negative but ID was positive at 0.5 mg/ml (W/F of 4/10) and 5 mg/ml (W/F o 5/10). See image below. One could question whether this is an IgE-mediated event. Perhaps it is or perhaps in the occasional patient the antihistamine acts as an agonist, binding to the receptor instead of blocking it thereby triggering histamine release. Anaphylactic shock caused by a challenge with 12.5 mg oral diphenhydramine has been reported and the authors of this case suggest the mechanism was IgE-mediated.
. So what? Never say never when a patient comes in with a bizarre drug allergy or states that are allergic to Benadryl….you might be surprised! reaction due to diphenhydramine. Allergy. 1998; 53: 814. 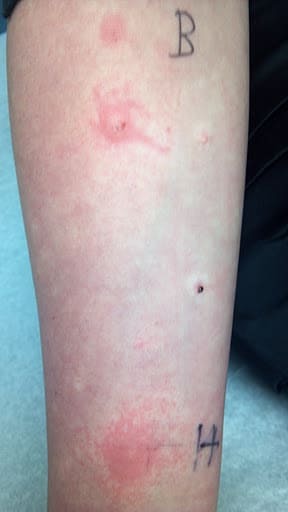 Ring J. Anaphylaxis to mizolastine. J Allergy Clin Immunol. Núñez-Acevedo B, Bartolomé Álvarez JM, Martínez-Cócera C.
Allergol Clin Immunol. 2009; 19 (4): 317-20. 5. Demoly P, Messaad D, Benahmed S, Sahla H, Bousquet J.
Hypersensitivity to H1-antihistamines. Allergy. 2000; 55: 679-80.
general considerations. Allergy. 2003; 58: 854-63. This is from Gary Stadtmauer, MD’s blog.